Died December 1, 2018, beloved husband of the late Agnes, much-loved father of Karen, Clare, John and Steven, loving father-in-law of Robert, Colin, Carrie and Michael and a devoted grandfather of Sarah-Louise, Clare, Jay-Jay, Louise, Robert, Jackson, Lauren, Jessica, Joel and Jerzey. Funeral Service will be held from his daughters home, 99 York Road on Friday 7th at 9.00 a.m. and afterwards to Roselawn Crematorium for 10.30 a.m.
Family flowers only please. 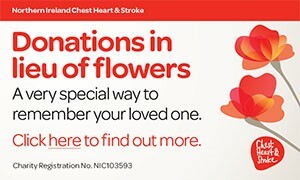 Donations in lieu, if desired, to N I Hospice c/o Stephen McCosh Funeral Directors, 117 Shankill Road, Belfast, BT13 1FD. you were gone before we knew and only God knows why. .
Sincere sympathy to our brother-in-law John, Carrie and family, also to Karen, Clare and Steven and families. Deeply regretted by Agnes Junk and family circle. Deeply regretted by Tommy and Esther Noble and family, Kathleen and Billy Boyles and family. I am sorry to tell you that William Noble (Billy) HADDOCK has passed away.